Lambeth on ContraceptivesBy Charles Gore, D.D., D.C.L., LL. D.
The Conference, while declining to lay down rules which will meet the needs of every abnormal case, regards with grave concern the spread in modern society of theories and practices hostile to the family. We utter an emphatic warning against the use of unnatural means for the avoidance of conception, together with the grave dangers—physical, moral, and religious—thereby incurred, and against the evils with which the extension of such use threatens the race. In opposition to the teaching which, under the name of science and religion, encourages married people in the deliberate cultivation of sexual union as an end in itself, we steadfastly uphold what must always be regarded as the governing considerations of Christian marriage. One is the primary purpose for which marriage exists—namely the continuation of the race through the gift and heritage of children; the other is the paramount importance in married life of deliberate and thoughtful self-control. We desire solemnly to commend what we have said to Christian people and to all who will hear. This is no doubt a restricted admission, but it is a definite withdrawal of the quite general condemnation expressed in the Resolution of 1920, and I fear it will be the only part of the contribution of the recent Conference to the question of sexual relations which will be seriously effective. The classes of persons aimed at in Resolutions 13, 14, 16, and 18 are not those which pay any attention to what the Church says. The same must be said of the worldly-minded who use contraceptives from motives of selfishness, luxury, and convenience: such people know quite well that they are disregarding ‘the parsons,’ and have no intention of listening to them. But there is a large class which cannot brace itself to ignore the voice of the Church. They have been anxiously waiting to hear what the bishops will say. No doubt they feel that their cases are ‘hard cases.’ In different ways we are all apt to feel that. They think that they have a morally sound reason for avoiding parenthood, and that they cannot practise abstinence. Now they learn that a representative assembly of the chief authorities of the Anglican Communion has ‘removed the taboo’ on contraceptive methods, and no doubt their scruples will in many cases be silenced and the easier course taken. I observe that the Bishop of London says that he agrees with the conclusion of another bishop who, ‘reading the resolutions as a whole, thinks the balance appears quite definitely on the side of strictness.’ I fear that this is practically the exact opposite of the truth. I think the clause which sanctions certain methods as a ‘regrettable necessity’ in certain cases (to use the bishop’s expression) is the only clause which is likely to have any considerable effect: and I cannot doubt that that effect will be disastrous. Rod Dreher over at the crunchy-con blog has directed his readers toward an article by Philip Jenkins about African Christian opposition to Homosexuality. 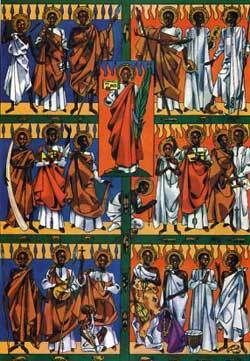 The Ugandan Martyrs included both Roman Catholic and Anglican Christians and are commemorated in both communions. The Muslim context helps explain the sensitivity of gay issues in one other key respect. In the region later known as Uganda, Christianity first arrived in the 1870s, when the area was already under Muslim influence and a hunting ground for Arab slave-raiders. The king of Buganda had adopted Arab customs of pederasty, and he expected the young men of his court to submit to his demands. But a growing number of Christian courtiers and pages refused to participate, despite his threats, and an enraged king launched a persecution that resulted in hundreds of martyrdoms: On a single day, some 30 Bugandans were burned alive. Yet the area’s churches flourished, and, eventually, the British expelled the Arab slavers. That foundation story remains well-known in the region, and it intertwines Christianity with resistance to tyranny and Muslim imperialism–both symbolized by sexual deviance. Reinforcing such memories are more recent experiences with Muslim tyrants, such as Idi Amin, whose victims included the head of his country’s Anglican Church. For many Africans, then, sexual unorthodoxy has implications that are at once un-Christian, anti-national, and oppressive. You can read about the Martyrs of Uganda, who we celebrate on June 3rd, here. The byline was at the end of the piece and, thus, I was well into reading it before I said to myself, “Wait a minute. This writer has the ability to stay calm about a subject that is driving almost everyone else into journalistic craziness. Who is this guy?” I also wondered what the piece was doing in The New Republic, only that wouldn’t really be a fair statement since the magazines runs a wide variety of excellent work on religious topics.